4oD (Catchup) on a mac – epilogue. Launched waaaaaay back in Novemeber 2006, 4oD (well the catchup service at least) is now finally available for Macs. All mac users now see the ‘sorry’ ad pre-roll above and let’s hope the apology is excepted ;-). Some stats from Pipes show that 6.7% of viewers were Mac users in the past weeks, and my posts on 4oD (here and here) are some of the most read on this blog. The online video world has changed much since 4oD came to life on that dark autumnal night. The quick replacement of the desktop client option with the streamed-in-a-browser version of both the iPlayer and 4oD Catch-up has been interesting, i doubt anyone saw that being popular. From my own point of view I’ve never watched a downloaded programme using the iPlayer mac client, I downloaded a handful, but kept forgetting to watch them and they all expired. So what about the future? Well, it seems we’ve not got a new and interesting distribution model, now all we need is to change the programme format. In this on-demand streaming age, why stick to 6x30mins? Finding supporting content doesn’t get taffa than this! Having just watched the Masterchef final where Mssrs Wallace and Torode crowned (though with that trophy branded might be more appropriate) family man and Beaminster resident Mat Follas the winner, I headed over to the beeb site for more post TV buzz/come down. The BBC homepage had nothing, ditto the /two page, the /food page is as quiet as the grave and /masterchef redirects to one of those SSI API cobbled together programme pages. Sadly I knew this would probably be the case. It’s a shame because this is the grand final of the series, a series which w/e 15th February was the 1st, 2nd, 4th and 7th most watched programme on BBC Two according to BARB, and last night got 4.7 million viewers, Not too shabby then. Meanwhile over at the Guardian WoM page it was all kicking off with live blogging by Anna P and over three pages of comments, jokes and observations. 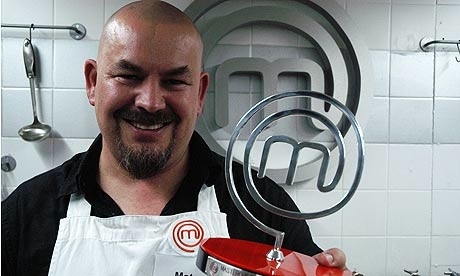 There’s even Masterchef bingo cards. After the show The Mail had a story up, as did the METRO. The wikipedia page was updated at 9:16pm and even Thisisnorthdevon.co.uk updated it’s page about local boy Andy Oliver loosing for Gods sake! Yet the beeb had nothing to see. There’s two things to consider here. The Guardian has, of late, done a nice line in articles, blogging, and commenting on mainstream TV shows. It’s been quietly hoovering up small pockets of interested folk and no doubt keeping some of them along the way. It’s been doing this for Channel 4 TV shows too. Emily Bell must be thrilled. Secondly, despite the BBC (and others) banging on about connecting with viewers interests and wanting to ‘own the watercooler chat’ moment, they’re not, because The Big G (and bloggers) are doing it very very well indeed. It’s the same thing with University Challenge Final on Monday. All the hullaballoo about Gail Trimble et al, the BBC could have had those eyeballs, comments and page impressions (and love her/loathe her debate). ‘Course in my day the argument was ‘we don’t have the tools’, well that’s not true anymore, the Beeb’s actually got it’s blogging kit in place. I know budgets are finite but still. These things are pre-recorded just as a drama is, it must be possible to create some content around them? A ‘tonight’s TV page’ perhaps? I think someone’s missing a trick, and more importantly audience, and it’s not the Guardian. Lots in the media’s paper about this this morning. What a bloody mess, lots of public comments about how two massive high street banks can merge – fine – and that Ofcom thinks C4 and BBC Worldwide should merge – fine – but this isn’t allowed. Emily sums it up well I feel. Here’s what I think. This report kicked off July last year, a lot has changed since then I reckon. We’ll see how this pans out but from here it looks like a blow to Brit media and to my friends who’ve worked on the project. So all hopes are pinned on Project Marquee, or Project Canvas, the later “…requires BBC Trust approval but it’s hoped that the initiative will get under way by 2010″ (source) by which time the world will have turned again and they’ll be different hoops to jump through. You know when C4 built 4oD they got it out the door in about six months. They say content drives technology, (the Coronation and TV take up) I reckon we won’t see a thing until… the Olympics? The Ross/Brand affair leads to Civil War! I’m back! And what worse way to start up eyedropper again than commenting on the meme du jour? Normal service will resume shortly: Until then, have this mind dribble. Oct 16, 2008 – The comedians leave several lewd messages on the actor’s answerphone after he was not available for an interview. Oct 31, 2008 – Channel Five air an interview with Andrew Sachs’ granddaughter Georgina Baillie in a documentary called Russell & Ross: What the F*** Was All That About? The whole event, coupled with the financial meltdown and lack of a good Christmas leads to more unrest. The population falls into two main camps. Friends, neighbours, even members of the same family all turn on each other. Beatings and lynchings become common. No one is going to work, the economy crumbles, inflation is at 500%. The army, all ready over stretched in Iraq and Afganistan is unable to keep the peace. Like Attlee in ’39, Thompson becomes an ineffective leader constantly appealing for peace and dialogue. 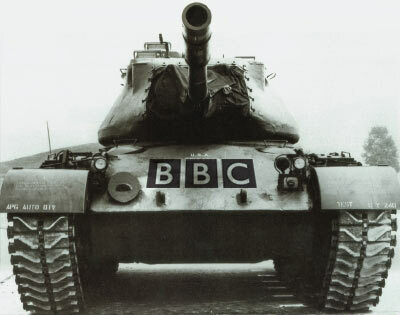 Ross stages a coup and installs himself as ‘Content Protector General’ of the BBC. Brand returns as the bizaarly titled “Minister of Joy’ and mounts a campaign of terror. The Mail, which backs the Sachians resorts to dropping papers out of planes and signs the treaty of Isleworth with Sky to provide “supporting broadcast services” according to the Mail. The BBC’s crack Drama division succeed in detonating a ‘dirty bomb’ in the Royal Borough of Tonbridge Wells, having had ‘practice‘ in 2003. Field Marshall Clifford leads 7,000 troops and captures BBC Manchester, Content Protector General Ross swears to retake it and mounts a massive counter attack from BBC Liverpool and BBC Leeds and Sheffield, the loss of life is the highest yet on both sides leading the campaign to be dubbed the ‘Slaughter of Salford’. Ross appears on all TV, internet and radio stations at the same time saying the war can be won. But huge areas of the country are in the hands of the Sachians forces.